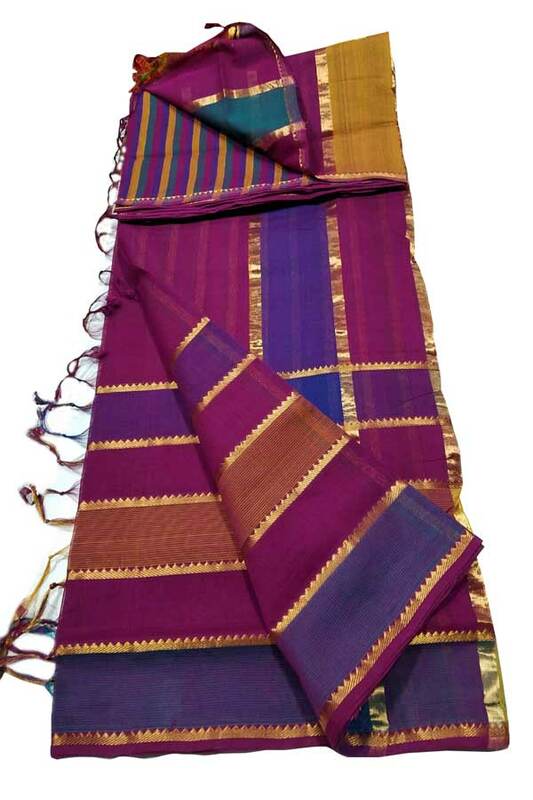 Violet colored Cotton Pallu has classic Gold coloured 7 lines zari checks running along its entire length. Mangalagiri sarees are unique variety, woven from cotton and has the most characteristic features such like zari on the border. The Mangalagiri sarees come in a host of bold colors that make it look very elegant and gorgeous.This Handwoven Violet colour saree with contrasting Multi color border and pallu is light weight and easy to wear. Mangalagiri sarees are a popular handloom product from the state of Andhra Pradesh. The occupation of weaving is as old as 500 years as per some inscriptions found at this region.